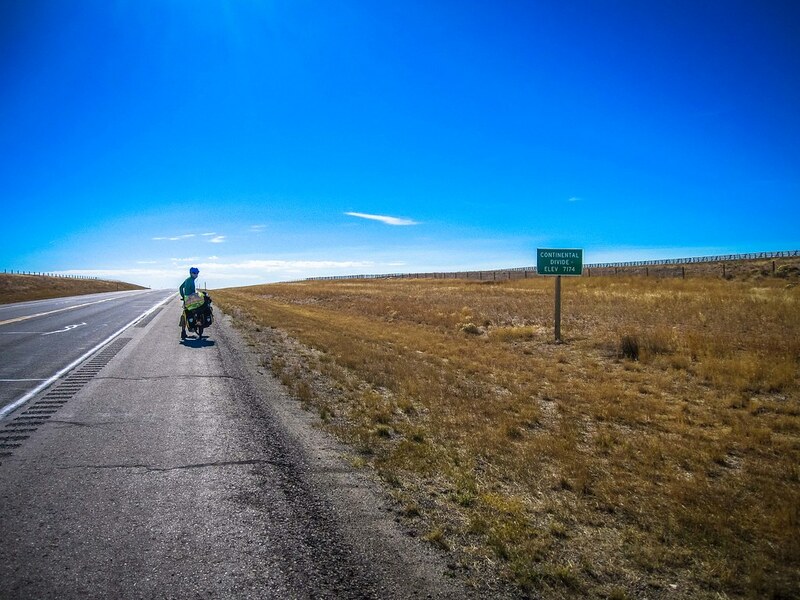 Continuing south on Hwy#287, up and over the Continental Divide (15th time??) 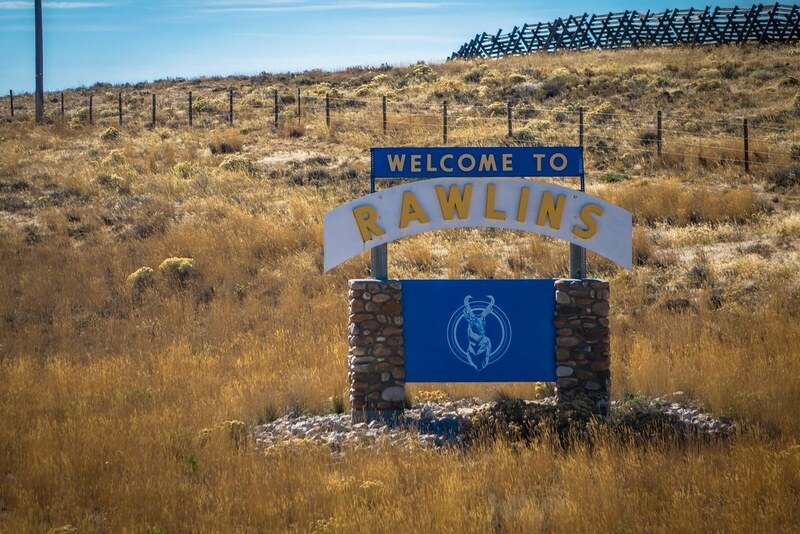 and in to Rawlins. Andrew writes: We continued heading south towards Saratoga today, hoping to enjoy the hot springs in a few days. Fate stepped in though and drastically altered our plans. It all started innocently enough, with Amanda drafting behind me as we climbed up and over the Divide this morning, the wind head-on, or cross-wise to us. 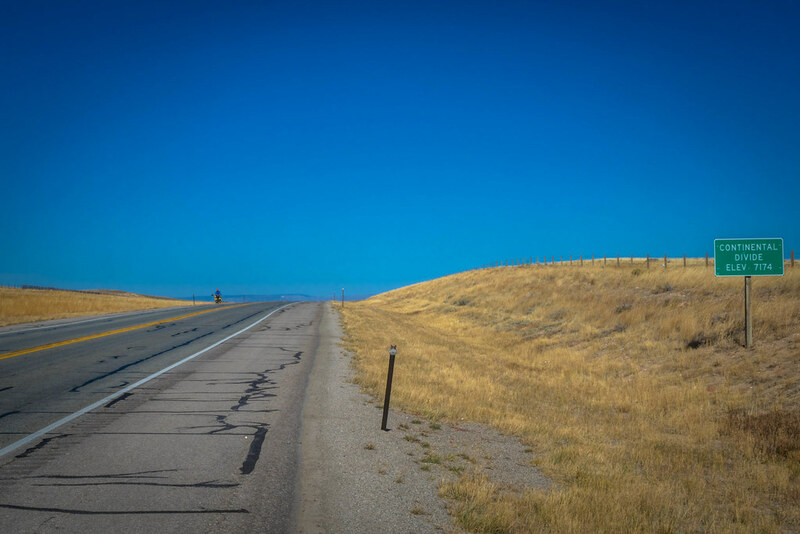 A hunter said to us the other day that we won’t find a mile of flat land in Wyoming, and I’m really starting to believe him. 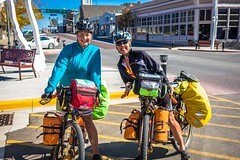 We pulled in to Rawlins itself around lunch time, and while we were looking for a place to eat, we came across Sherry and Ashley, a mother and daughter cycling the Great Divide Mountain Bike Route (GDMBR). We probably spent about 20 minutes chatting with them. They seemed really nice; too bad they were on their way out of town at the time. 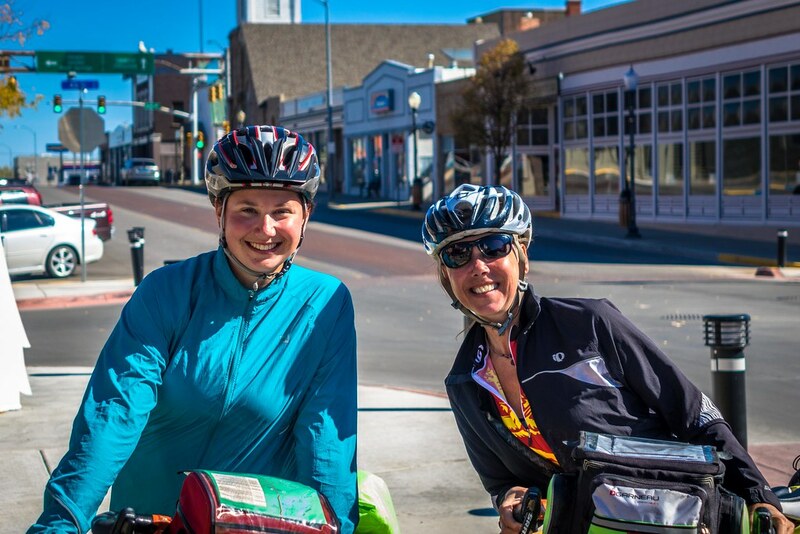 If we had already eaten lunch, we likely could have pulled in behind them and ridden south towards Saratoga. Instead, we pulled in to the Trans-America truck stop, which we had first experienced last year when driving down to Mexico. It features an “All-You-Can-Eat” buffet, that I absolutely wanted to destroy. Amanda put a pretty good dent into the salad bar. Tragedy struck however, as Amanda somehow managed to tweak her back while using the toilet. She came wincing out of the washroom, and barely managed to sit in her booth, as I tucked into my 4th plate of ribs and mashed potatoes. I knew then that we would never get up and over the 10,000 foot pass into Colorado after Saratoga, unless we took a rest day here and now. 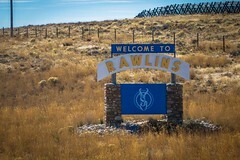 There is a Best Western in Rawlins, actually in addition to two prisons there are about 50 hotels/motels. The city itself reminded us a lot of Crescent City, California just in the gritty feel it had. Anyhow, we checked into the Best Western and used a gift-card we had received when we left Canada to pay for the room. Amanda’s back wasn’t any better the next day, so we used BW Rewards Points to pay for another night. 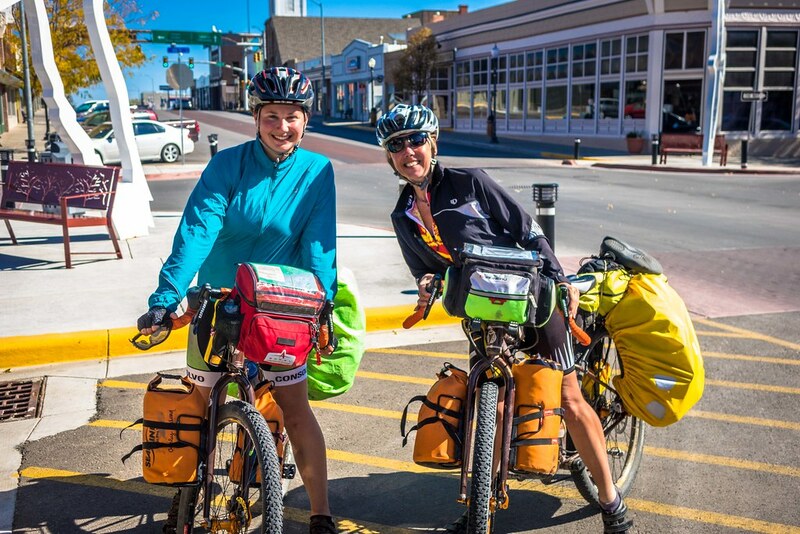 There still wasn’t a big change, so we decided to skip Saratoga and take a relatively flat route east to Laramie. Hopefully her back gets better soon! Okay so it wasn’t exactly like Andrew described. The tweaking of my back didn’t have anything to do with my bowel movement or the fact that I just over ate more than I have done in some time. 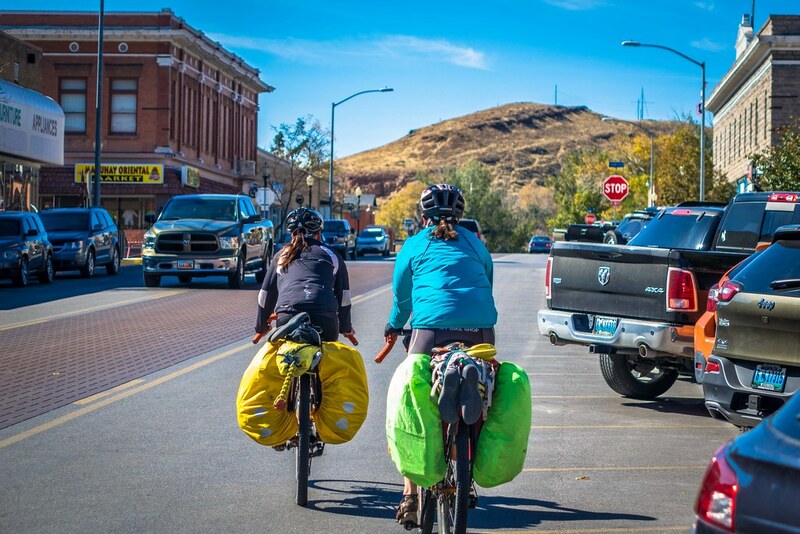 All-you-can-eat buffet sounds like an incredibly awesome idea as a starving cyclist … at least that is what I though. Apparently I can’t eat that much even when I’m starving. Clearly my body just likes to eat continually all day. Don’t get me wrong I can eat a lot of food now, just not at one sitting. So my back. I think it’s a combination of a lot of things just piling up. Remember that day a few days back when I totally pushed myself beyond what I know is best? Well two days after that day I woke up and the front of my hips were so incredibly sore which I think was tight hip flexers. Then the next day my knees were super sore which is not uncommon but I’d say they were more sore than usual. And from there I just figure the discomfort and fatigue worked it’s way up my body finally culminating in me wrenching my lower left back. If anyone else was in the washroom when I pulled my back, they were probably wondering what the heck was going on. I limped back to the table and Andrew and I decided to stay in a hotel for the first time due to fatigue since our trip began over a year ago. A big thanks to my former colleagues and friends for the gift card because I needed it. I could barely get my leg over my top bar of my bike let alone pedal. The hotel was great as was the hot tub. It was also incredibly fortunate that this happened on a Sunday football day. 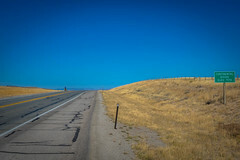 The Continental Divide near Rawlins, WY. 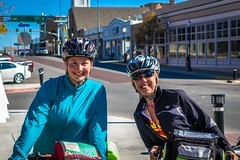 Ashley and her mom Sherry, cycling from Banff to Mexico (GDMBR). 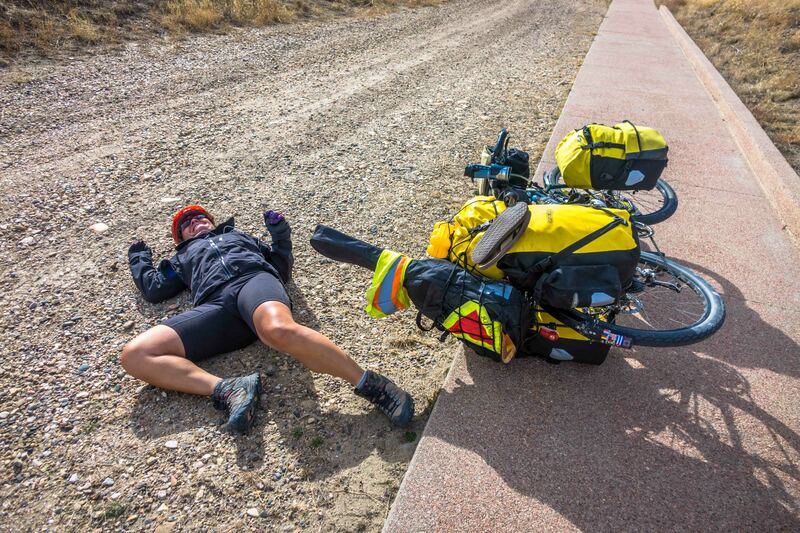 So, what the heck are you doing lying on the ground?…..Hip flexor stretching?….or just needed to feel the earth move under your frame….but I am glad you took some rest days…..now, Plenty of those for the Prentys! Oh no! Poor Amanda….sure hope you are feeling better now! We have spent 1723 days exploring the world so far!